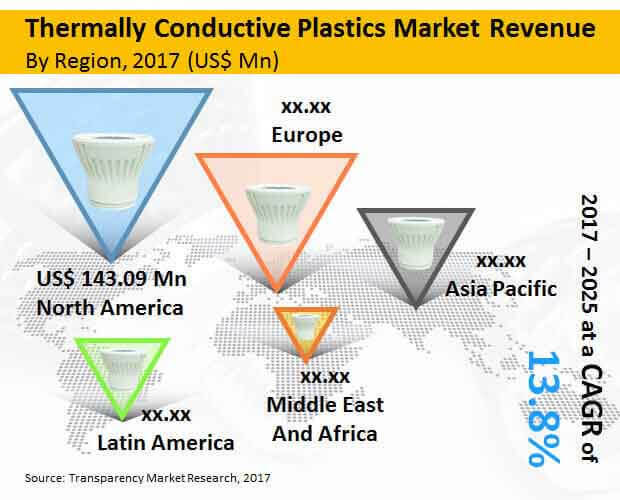 The thermally conductive plastics market is expected to grow in the forecasted period due to increasing demand from end use industries such as electrical and electronics, automotive, industrial, healthcare and aerospace industries. The vast rise in production and uptake of vehicles is anticipated to drive the demand for thermally conductive plastics products in the automotive industry. Typical applications of BN-based thermally conductive plastics include heat sinks for LEDs and other heat sources, electronic device housings, heat exchangers, battery housings and temperature sensors and cooling systems. As devices become smaller and gain more functionality, demand for these applications is growing. Replacing aluminum and other metals with TCP’s will provide the advantages of the light weight as well as design and color freedom. As costs come down, TCP’s will also become more viable in the coming days. According to the report, the thermally conductive plastics market is expected to expand at an impressive CAGR of 13.8 % from 2017 to 2025. In terms of type, the thermally conductive plastics can be classified into Polyamide (PA), Polybutylene terephthalate (PBT), Polycarbonate (PC), Polyetherimide (PEI), Polyphenylene Sulfide (PPS), and others (PEEK, PEKK). Of these, the segment of polybutylene terephthalate (PBT) accounted for the dominant market share in the global thermally conductive plastics and is likely to see high demand over the forecast period as well. The overall demand for polycarbonate and polyetherimide is also propelling owing to demand from electrical and electronics and automotive industries. In terms of the application, the thermally conductive plastics market is segmented into electrical and electronics, automotive, industrial, healthcare, aerospace and others. The electrical and electronics segment accounted for the highest share of the market in 2016 in terms of volume while industrial segment is anticipated to exhibit the fastest growth during the forecast period. Geographically, the thermally conductive plastics market has been examined in the report for regions such as North America, Europe, Asia Pacific, Middle East and Africa, and Latin America. In terms of volume, Asia pacific dominates the market for thermally conductive plastics followed by Europe and North America. Factors such as the increasing demand for smart electronics and personal vehicles in the region is projected to raise the demand for thermally conductive plastics. The well-established electronics manufacturing sector and a steadily expanding automotive manufacturing industry are also expected to work well for the regional market. North America holds significant share in the thermally conductive plastics market due to the strong presence of thermally conductive plastics plastic manufacturers in the region. Similarly, Europe, and Latin America are also developing regions and expected to witness remarkable growth during the forecast period. Key players operating in the global thermally conductive plastics market include Celanese Corporation, Koninklijke DSM N.V. (Royal DSM), Poly One Corporation, Kaneka Corporation, Toray Industries Inc., SABIC Group, Exxon Mobil Corporation, E.I.du Pont de Nemours and Company, Arkema Group , Compagnie de Saint-Gobain SA etc.